Steven and Krystina Schuler designed their home in Middletown, Del., with the help of architects from DIGSAU. 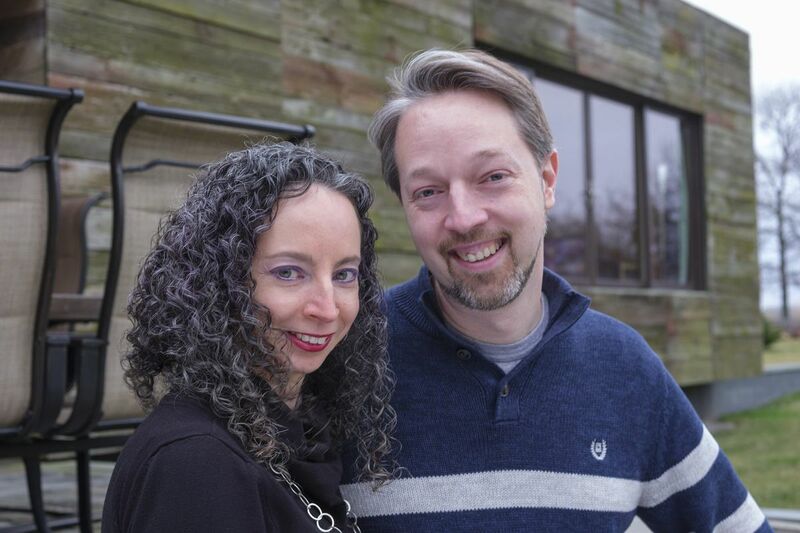 The one-level house near Middletown, Del., doesn't fit neatly into any architectural style, and that suits owners Steven and Krystina Schuler just fine. The house, down a long driveway on a 2½-acre wooded lot, looks like a small, glass-encircled block covered with mismatched planks. It faces groves of large trees and an open field. "We wanted a house that looks like a Frank Lloyd Wright house, but we didn't want it to be so modern that it could be dated in 20 years," says Steven, who met Krystina when they were students at Susquehanna University in Selinsgrove, Pa.
Steven, a computer expert who works as a subcontractor for a suburban Philadelphia firm, said he and Krystina knew exactly what they wanted when they started the process of building their house. The pair share a love of individuality and privacy. And the farther south they located, "the cheaper things get." The Schulers’ home is clad with boards salvaged from an old barn. When they were ready to build, they found Digsau of Philadelphia through a friend. It seems like a perfect match of architect and client. "We don't do many residential properties, but the ones we do have to be interesting and the people have to know what they want," said Mark Sanderson, one of the four architects who formed the firm, which specializes in collaboration with its clients. For a year or more, Sanderson and Digsau colleague Jamie Unkefer worked with the Schulers on a plan that was heavy on innovation while stressing their need to curtail expenses, including a deal Steven made to tear down a sagging 100-year-old barn nearby in exchange for the wood planks, now on the exterior of the house. The architects saved the couple money by using double sliding doors rather than windows to bring light into every room. The result seamlessly connects kitchen, living room and dining room, as well as indoor-to-outdoor living space. The house was finished in 2013, when the couple's son, Simon, was 2. The design by Digsau links indoor and outdoor spaces. The center core of the house has three bedrooms and baths, which can be closed off with pocket doors to maintain heat and curtail noise while Simon sleeps. "We tell people that our house is a circle of 54 feet by 54 feet, and Simon can enjoy himself running around in circles," Steven says. "There is a large window in every room, and the house was designed so there is a view from every window." The house was recognized for its design by the Philadelphia and Pennsylvania chapters of American Institute of Architects the year it was finished. The Digsau design provides an exterior envelope that's fire- and moisture-resistant and impervious to wood-boring insects, Sanderson said. Foamed-glass insulation allows the salvaged planks to be properly ventilated in a manner similar to traditional barns. Durability is important to Steven, who says, "This is our last house, and we can paint it and do as we want." For the outer walls of the rooms in the outer circle, the couple chose beige; the inner circle is blue. "The only other color is in Simon's room," Steven says. The house’s circular design is perfect for 7-year-old Simon to run around. If they ever do sell, they have concrete proof they were the original owners, Steven says, pointing to a patch cemented in the basement with the family's handprints. Until recently, Steven commuted an hour each way to work every day. Now he works at home several days a week. Krystina quit her job as a paralegal when Simon was born and now works at home, writing her second book. Her first was self-published. "I really love it here," Krystina says. "We lived in a cookie cutter house in Bear, Del., before we moved here." Neither Schuler misses a busier community. "We wanted an urban loft in a country location." Steven Schuler recovered boards from this barn to use on his home in the Delaware countryside.